Thanks to everyone who made Selvage such a great success. We will will be back later in the year for more knitting lessons. Thanks to everyone who made it out. We are delighted with the responses and ovations at our Galway run for our newest play, Selvage. Excited about touring it to Clifden next week. Thanks to the Arts Council and Galway City and County Councils. From the USA to China, the U.K to Yahoo, The Fisherwives cast their net far! We are delighted to see images from Reuters of The Fisherwives were to be found as ‘Image of the Day/Week’ all over the world as well as The Irish Times and The Telegraph (U.K.) Thanks to everyone involved in making it so special. Great write up to mark tickets for Selvage at the Mick Lally Theatre going on sale. We are delighted to have been chosen to be part of Pathways to Production this year and to have access to such amazing institutions as we create Nighland, a mask piece about Izzy’s journey to Nighland. 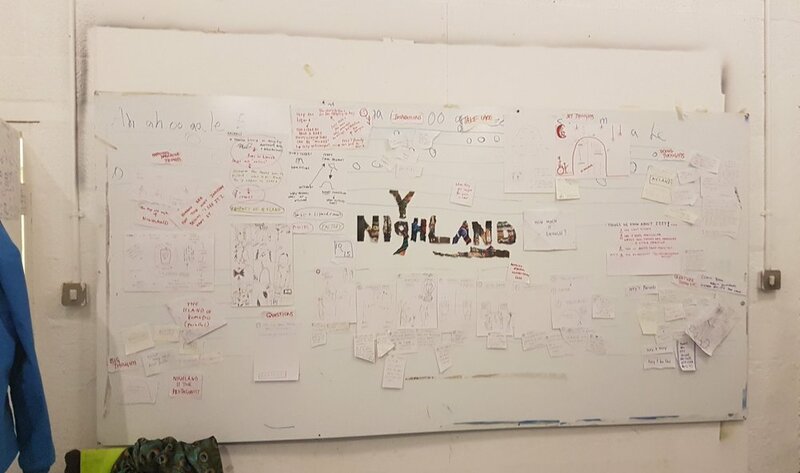 Brú’s fourth production, Nighland begins! We had the very best time spending two weeks on residency in the wonderful Áras Éanna supported by Galway County Council. Our newest show will have its first showing in May. We were delighted to tour Cleite out to the breathtaking Teach Uí Phiarsaigh in Rosmuc as part of our sold our run at Baboró festival this year. Brú Theatre's website is live! For any queries email us on theatrebru@gmail.com.